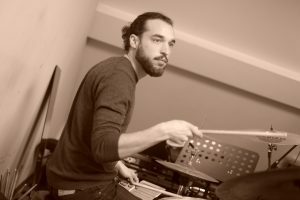 Based in Brussels, Sébastien Peeters is a versatile drummer and vibraphone player. He developed his musicality by playing a lot of different kinds of music: starting with the funkiest grooves to the most modern electronic music passing by Latin, Jazz and Reggae. Also, he studied classical percussions in high school then followed the Jazz path at the « Conservatoire Royal de Musique » in Brussels to perfect his skills in drumming and vibing. Mostly seen in the European scene, he also traveled around Asia with his mallets and sticks to play with one of the most appreciated party band: Midnight Avenue. Some of the best venues and events he played in: @ One&Only Reethi Rah, Maldives – @ Zeta Bar – Hilton Hotel, Kuala Lumpur – @ Mezzanote Bianca, Perugia – @ Longines Masters, Paris – @ Villa Rothschild, Nice – @ Festival Sfinks, Antwerpen – @ Ancienne Belgique, Brussels – @ Botanique, Brussels – @ Cirque Royal, Brussels.